during concentrated visual work (eg screen work, driving a car, television) with rare blinking of the eyelids. In such conditions the tear film is not renewed sufficiently often - it ruptures and the tissue becomes dry. 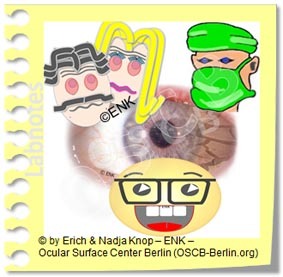 Many negative factors in office work can lead to the so-called " office eye ". This describes concentrated visual work with a rare blinking in a dry air, e.g due to air conditioning, often with mental stress, perhaps with additional smoking, irregular drinking or with drinks that are more likely to lead to water loss, such as coffee and tea. 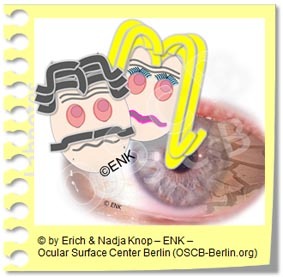 regular complete eyelid blinks and short breaks, with blink exercises during concentrated visual work (computer screen, driving a car, etc.). 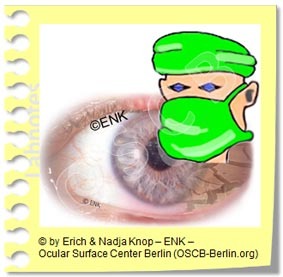 In the Blink exercises, the eyes are vigorously closed and reopened several times to renew the tear film and force oil from the meibomian glands onto the eyelid margin and onto the tear film.